For better or worse, reputation has a habit of sticking around longer than reality. 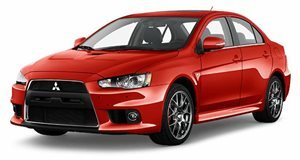 Take Mitsubishi, for example, which enthusiasts still fondly remember for its rally prowess, even if it only sells crossovers and budget subcompacts these days. But as the manufacturer itself points out, it's been a long time since it last dominated the World Rally Championship. 20 years, to be precise. In 1999 Tommi Makinen drove his Lancer Evo to the fourth and last in an unbroken string of world titles that gave Mitsubishi the reputation it still holds in the hearts of the faithful. Though the Mitsubishi Ralliart team only scored one constructors' championship along the way (in 1998), Makinen's winning streak in a succession of Lancers was one of the longest up to that point in rally history – longer than Audi, Lancia, Toyota, and certainly its arch-rival Subaru – until Sebastien Loeb and Citroën came to dominate the discipline from 2004 to 2012. Mitsu's prowess on the rally stage yielded a succession of Lancer Evo road cars as well, which remained in production until the Evo X was discontinued in 2016 after a ten-year run. By that point, the Ralliart team hadn't competed in nine years. It hadn't won a single rally either in 15 years – the last season in which Makinen drove for Mitsubishi, winning in Monte Carlo, Portugal, and Kenya. The next year he switched to Subaru, won the Monte Carlo rally one more time, and retired after the following season. Now 18 years since its last win and 20 since its last title, Mitsubishi is a very different company – owned (in part) by former rival Nissan. Maybe one day it'll get its groove back, on or off the rally stage. Until it does, the reputation it earned in the 1990s will continue to fade.